A weekend in Watford with a couple of tickets for Scotland's trip to Wembley in your back pocket. New Scotland manager Ally MacLeod leads the Scots to a 2-1 victory and you and your plus-one make it onto the pitch for the post-match celebrations. For most football fans it would be the perfect way to spend 48 hours. But most couples probably wouldn't see it as the ideal honeymoon. Gordon Strachan isn't most people. And thankfully for him, neither is his wife Lesley, who was just as keen to organise their big day around the Auld Enemy match. "We were on the pitch in 77," the Scotland manager said. "We had put our marriage forward a week when we found out the Scotland-England game was on the Saturday, so we went to Wembley for our honeymoon. We stayed in Watford. "My daughter's off to Barbados, we went to Watford. We ended up on the pitch but we were encouraged by a policeman to go on. "Me and my mate and Lesley were standing there and the policeman said 'You're the only ones standing there so you might as well get on'." At the time of that famous win, Strachan was 20-years-old and making his way in the game at Dundee. And as far as he was concerned, staying in football for the next 37 years was simply not on the agenda. "Our ambition at that point was that if we get enough money we might open a fish and chip shop in Arbroath or a sports shop in St Andrews, that was the ultimate ambition for the Strachan family." As it went, Strachan soon made the giant leap from stands to pitch, picking up 50 caps for Scotland and endearing himself to those he left behind on the terraces. At the World Cup in Mexico in 1986 he created one the most iconic images in Scottish football history when he scored a screamer against West Germany then perched his leg on the advertising boards that surrounded the playing surface at the Estadio La Corregidora. "We had seen every player who had scored goals jumping over the barriers and I thought it would just be my luck that if I jumped over there would be one of those moat things and I'd end up seven feet down at the other end, so I put my leg up to see if there was a moat there." Following a distinguished playing career that saw him add the names of Aberdeen, Manchester United and Leeds to his CV, Strachan ventured into management and approached it with the same passion. He did sterling work at Coventry City and Southampton before being named Celtic manager in 2005, where he won three titles and twice led the club into the last 16 of the Champions League. Strachan left Celtic in 2009 and following an ill-fated stint at Middlesbrough he took time out of football altogether. In 2013, Scotland came calling and Strachan took up a post he finally felt ready for. "As a kid you don't think, 'When I grow up I want to be the manager', the 57-year-old said. "Even when I played it seemed so far away, I thought 'That's a job for an old person and I'm not going to get old'. The fact is I got old. "The national job seemed to be more placid, more laid back. The characters who had it didn't seem to be fighting the world, they were men who had been in the game a long time and seemed more relaxed about the world. "I was out the game for a couple of years and life was great, then the Scotland vacancy was there and I thought 'Life's so good and I hope nobody asks me, because I really enjoy what I'm doing just now'. "I had the chance and as soon as someone asks you, you think 'I'm at the age just now and I can't turn this down, it's part of you as a Scotsman, and I think I can help here, I've got enough knowledge to help, I'm in a good place where I really don't want to fight the world but I want to help players and the national side'. "I can't even remember the process, I just remember the first meeting with Stewart Regan [SFA chief executive] was somewhere between Doncaster and Leeds on a really wintry night, snow everywhere. "I was kind of 50-50 but I had just been asked if I wanted the job and that makes a difference. My family thought it was right and I'd been enjoying being with my family so much, but I could do the job and still spend time with my family, which is the most important thing." The time was right for Strachan and Strachan was right for Scotland. The road to Brazil and the 2014 World Cup was all but blocked by the time he took over, and he suffered qualifying defeats at the hands of Wales and Serbia in his first two competitive games. But it didn't take Strachan long to make a positive impact, with wins against Croatia at home and away, as well as a triumph in Macedonia, putting a more respectable sheen on the Group A table. The target is now the Euro 2016 Championships in France, and while Scotland's opening qualifier ended in a 2-1 defeat, it was against world champions Germany and the performance offered real hope for the remaining games. "So far, I've enjoyed watching the players working hard and trying to do new things," Strachan added. "I've enjoyed the job so far, it was a bit difficult at the start, the first game you're thinking 'What have I done here' - you don't sleep, you're staring at a window at night thinking 'Where do we go from here,' but you brush yourself down and say 'Right, this is what we do from now on'. "It's just the love of the game, you can't get any better than if you love something. I love football, I love the people in the game, I love talking about it and laughing about it. "I would want to be in charge as long as the players want me in charge and they think I'm helping them. The fans are not daft, they can see if you've been unlucky at times. I enjoy what I'm doing now. I prepare for the future but I live in the present." 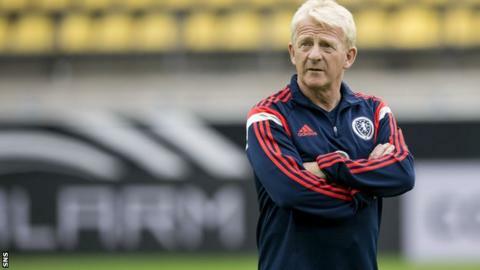 Gordon Strachan was speaking to BBC Scotland's Chick Young for the Managing Scotland series.